Heya, Ninja Blues readers and/or Indie Wonderland enthusiasts. Due to my last week’s waking time being a 50/50 split of long-distance travel and social interaction — i.e. ‘because I was on vacation abroad, visiting friends’ — I didn’t exactly have the kind of time I usually need to play any new game Indie Wonderland-style. Which is to say, I didn’t have time to play any video games last week, at all. I hope you understand that this puts a bit of a dent in regular Indie Wonderland service. Of course, I wouldn’t be me if I hadn’t planned for eventualities like this. I am a super genius. And as luck would have it, the week before last week, I did play a puzzle game called LYNE for a little bit. 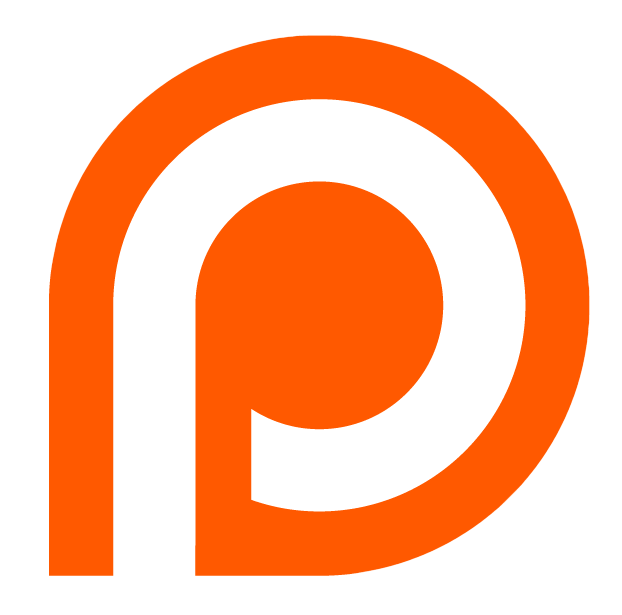 It’s not really a game I have a lot to say about, so don’t expect my usual multi-thousand-word rambling after the page jump, but hopefully this little nugget will tide you over until next week. Because I care about your well-being, readers, I really do. 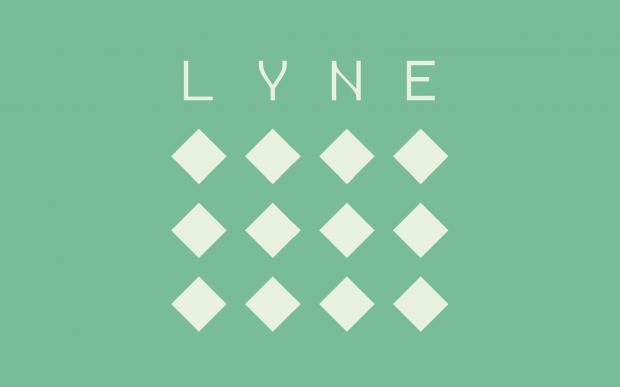 LYNE is a puzzle game about connecting the dots. You know that drawing puzzle that children play, where you draw a simple house with a cross down the center without lifting the pen off the paper, never going over any single line more than once? LYNE is that game, more or less. Every level has the same basic layout: you get a handful of nodes, and a whole mess of possible paths between those nodes, and your job is to link all nodes to one another without crossing or doubling paths. Here, this one’s on the house. LYNE starts out relatively simply. 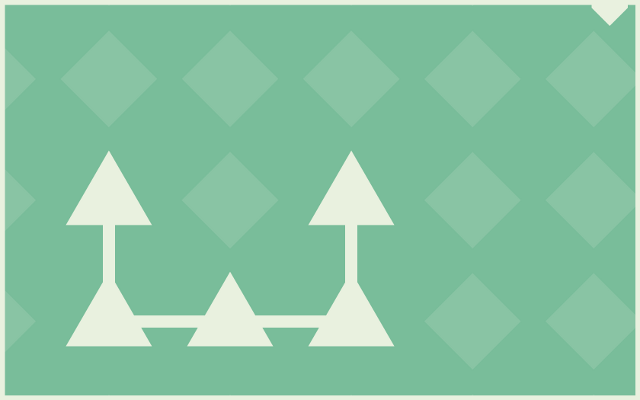 The two nodes that are different from the others are the designated start and end nodes, the two end-points of the line you’re crafting. 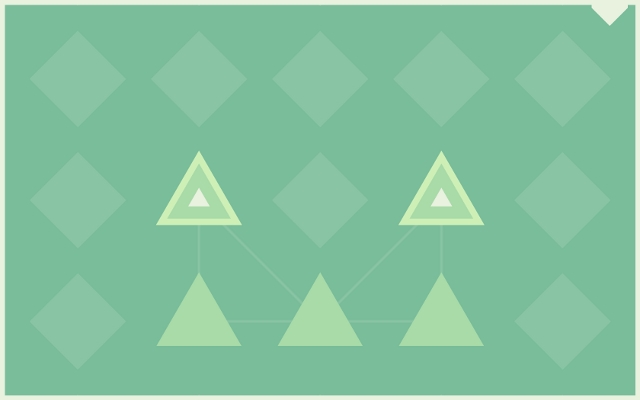 Don’t overlap paths and don’t leave any nodes out, and you’re basically fine. Before long, multiple colours are thrown into the mix. You can probably guess how this changes the rules: blue nodes connect to the blue line, green nodes to the green line, red nodes to the red line, etcetera, etcetera. It’s almost like what you are doing is building a metro system map, except that’s a different game. 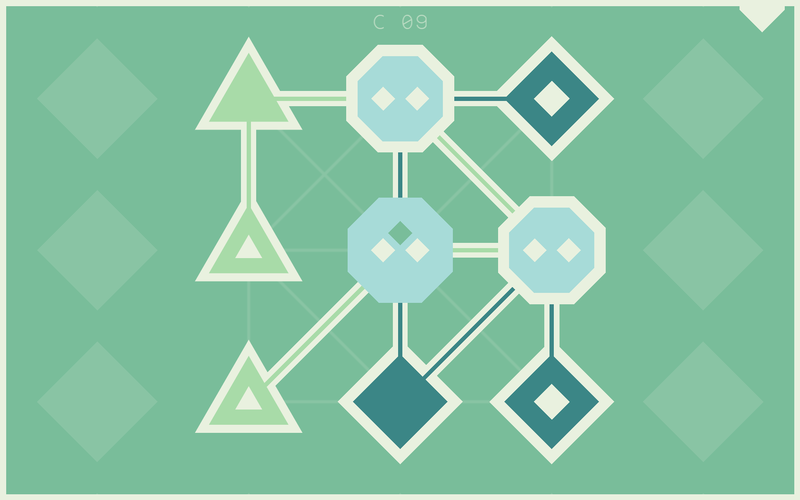 With the stringent ‘no-overlap, no-cross’ rules in place, there’s only so far clever puzzle design can go. If your differently coloured lines are like East and West, and never the twain shall meet, there is not a particularly large possibility space present to explore. Luckily, LYNE subverts this problem via the introduction of crossing nodes. Or whatever the devil these things are actually called. Crossing nodes, as their (probably not official in-game) name suggest, allow you to cross paths a few times. Each node comes with a couple of diamonds — minimum of two, otherwise there wouldn’t be any crossing, maximum of four, because of spatial restrictions — and each diamond represents one path that can be routed through the node. 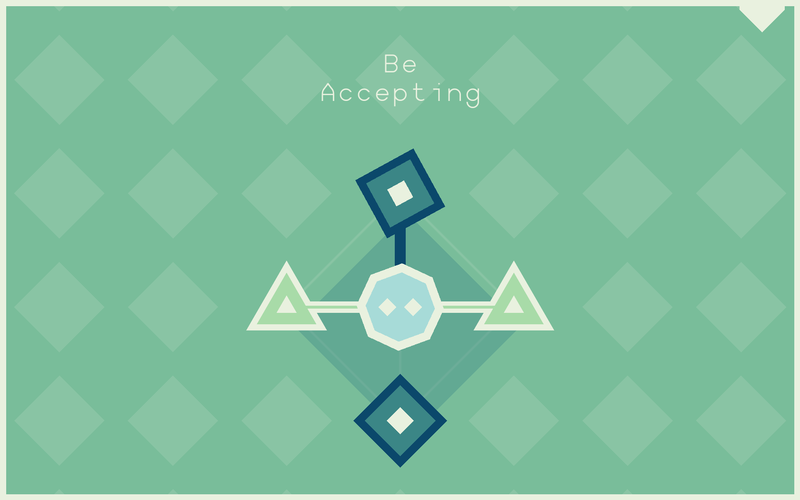 Each diamond corresponds to one line segment, basically. And within the (presumed) hyperdimensional geometry of the nodes, the normal rules of collision detection just Do Not Apply. That isn’t to say the crossing nodes are entirely benign masters, though. Those two, or three, of four diamonds? Those diamonds aren’t an optional invitation to avoid catastrophe, they’re a directive. You’re not allowed to route your lines through them, you are required to. 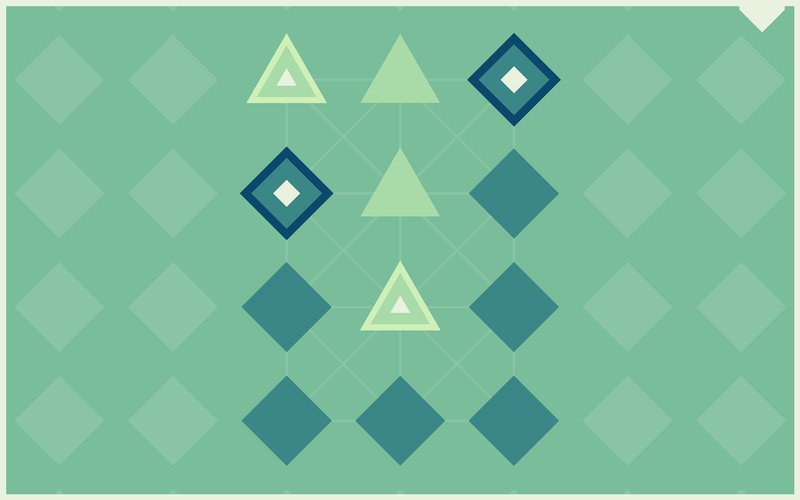 And from this, the actual solution is evident: just route the line from the top left diamond to the middle left end node through the center diamond, and you’re done. It’s an interesting gameplay mechanic, and layering it over LYNE’s basic concept makes for a handful of interesting puzzles that scale up in complexity, if not in difficulty. It’s just too bad that this appears to be all there is to LYNE. I kept waiting for other gameplay elements to show up, for more twists on the basic formula to materialize, because that tends to be the pattern puzzle games like this follow: gradually mix up the tedium with new tricks. But so far, that hasn’t happened in LYNE. 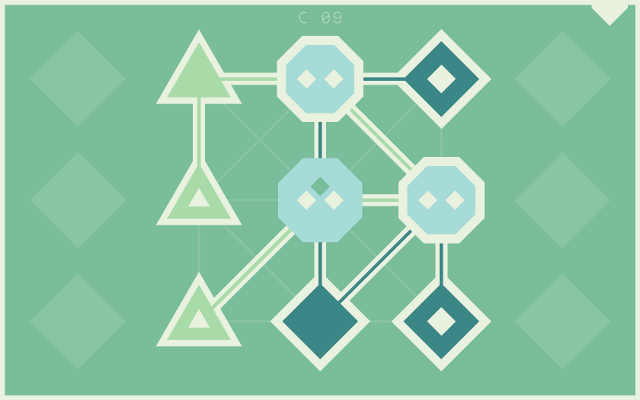 Once you figure out the crossing nodes, you’re mastered everything LYNE has to throw at you. Give or take a few more colours. 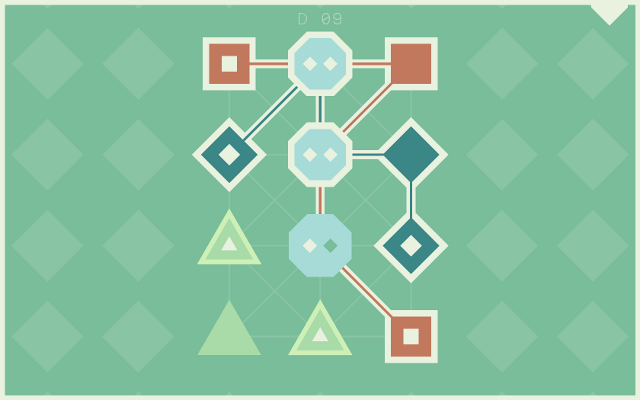 Some games revolve around mechanical mastery of simple gameplay systems through repetition and increasing difficulty. It’s a formula that works for stuff like racing games, for twitch games, and for certain kinds of puzzle games, and while it doesn’t tend to be ‘my thing’, I respect it for what it is. But while I get the sense that LYNE is trying to be this kind of game, its core gameplay is so simplistic that it just doesn’t work. 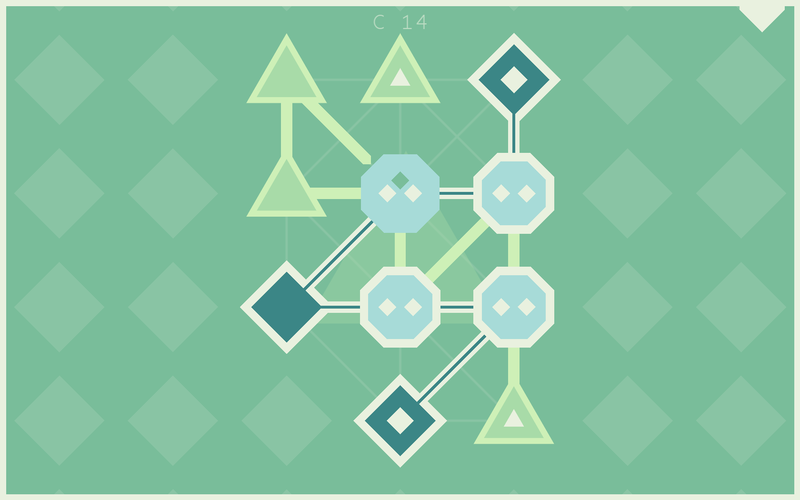 There is no sense of incremental increasing mastery in LYNE, because you’ve gained complete and total mastery over everything the game seems to have to offer you from the third puzzle with crossing nodes in it. The reality of the situation is that I got bored with LYNE relatively quickly. I kept waiting for it to change up, to throw another spanner in the works, but it never did. The main puzzles just kept revolving around this one rule I’d already mastered. And even the ‘daily’ puzzle sets, a gameplay mechanic I am very vulnerable to — as evidenced by stuff like Spelunky and Crypt of the NecroDancer — turned out to only be more of the same. Crossing nodes puzzles everywhere, all the time, forever. I gave LYNE plenty of time to surprise me with a new direction, but it never did. So I stopped playing. You’re getting a ‘short look’ at LYNE, not only because of my time issues, but also because there’s just not all that much to look at. I’ve more or less said what I have to say on it. Consequently, I can’t really recommend it very strongly. The simplistic gameplay revolves around mastery of a concept that doesn’t take much training to learn, and while the controls are intuitive enough, their clear touchscreen focus does make mouse control a little unwieldy at times. LYNE isn’t a bad game by any stretch, and as a mobile device time-waster — in line at the DMV, or something — it can probably be fun in bursts. But even then, I would recommend other games, like the superb Hoplite, before pointing you in the direction of LYNE. LYNE can be obtained for three dollars on Steam, on iOS, and on Android Play. Jarenth has eating sausages and mash in London, and waffles and french fries in Brussels. To suggest country-appropriate things for him to eat in Vienna (in two weeks), follow him on Twitter or hang out with him on Steam!